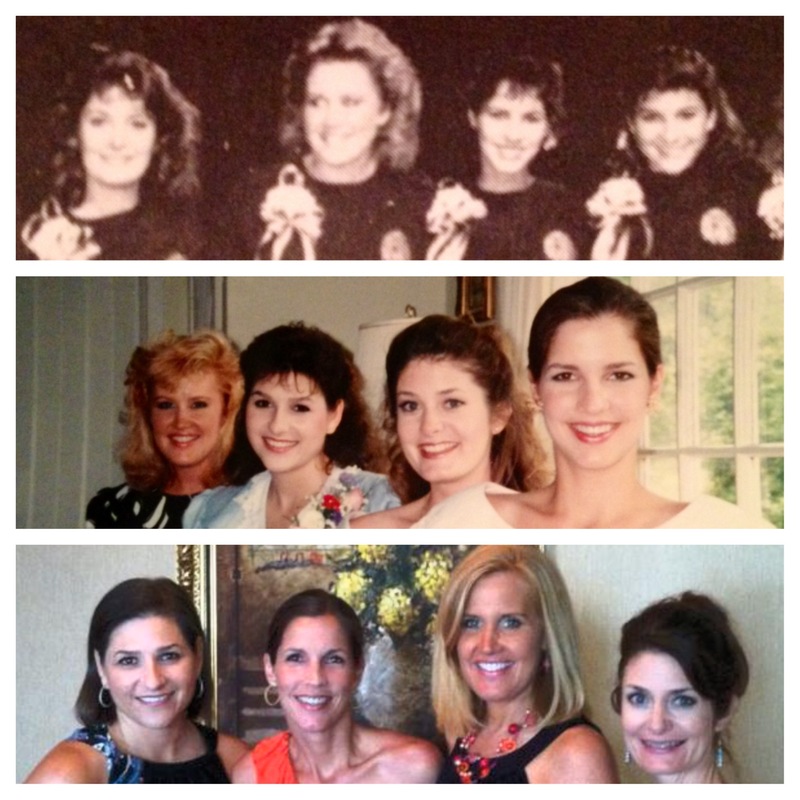 We’ve been friends for 30 years… 30 YEARS PEOPLE!! That is a really long time to continue liking someone who is not family and we not only like each other, we truly love each other and cannot imagine doing life without the others. We’ve definitely had our share of STUFF- cancer, divorce, career changes, infertility, marriage issues, faith crisis, children and so on but the one constant? Unfailing love and support. It started innocently enough, we were at cheerleading camp the summer before heading into our junior year of high school. Each room was a suite for four people so my best friend and I looked around to find two unsuspecting souls others to share a room with us. Our eyes locked with theirs and a beautiful friendship was born. I know most of you found your dearest and best friends in college. Maybe you were sorority sisters or were random roommates/hall mates but we are part of the smallest friend group in the world- lifelong friends from high school. We didn’t go to the same college, in fact we set off to three different schools yet we not only stayed best friends we became closer with every year. Once all the kids were old enough (we have 11 amongst the 4 of us) we decided it was time for some girl trips. (I’m sure when you think of girl trips you think of wild, crazy, not family friendly times but we are a different breed… no, we are NOT boring, just different thank you) We can spend an entire weekend watching movies, eating amazing food, playing cards and talking, lots and lots of talking. I use the term “watching movies” loosely because we’ve started hundreds of movies on these trips and yet only Shawn and I tend to see the endings. I don’t care if we start the movie at 8:00pm, Kay and Lynne are just not going to make it to the end. It’s like it is engrained in their brains to release melatonin and fall asleep before the ending. I’m seriously not making this up people!! Inevitably breakfast is spent with Shawn and me recapping the movie for the sleepy heads sometimes having to start from almost the beginning (Lynne has actually fallen asleep before the opening credits finished but don’t tell her I told you, K?) Is it weird? Yes, but it’s just what we do. Now that the kids are mostly in high school and up, we’ve gotten more creative with our trips. When you have four people splitting one room you can afford to go places that are super nice like the St Regis or the Ritz-Carlton (feel free to comp our room hotel people) and that is exactly what we do. We’ve started working our way through the east coast Ritz-Carlton’s one by one always staying at club level. Why club level you ask? One word, MACAROONS. Yep, Lynne is our self-proclaimed travel agent and she is in LOVE with macaroons. (I think she single handedly created the great macaroon shortage in Key Biscayne Florida in the summer of 2012 but I can’t prove it.) Another perk of staying at club level at the Ritz? ADULT ONLY POOL. Hello!! We’re there to enjoy a break from our family so it’s the perfect place to hang out and what else, talk. 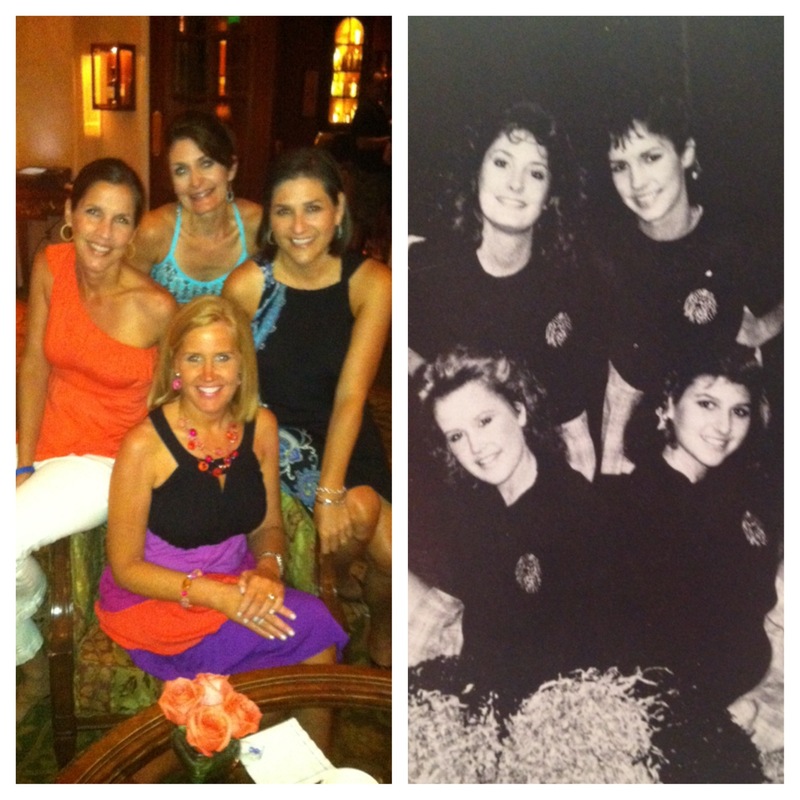 So ladies, as we celebrate the 30th anniversary of being the Awesome Foursome, I want to take this time to thank you. Thank you for not sharing with my kids all the trouble I may or may not have gotten into, times that I made a fool of myself in front of a boy and most importantly, how gifted I am with a roll of toilet paper and a few trees. Remember, I know your secrets too!